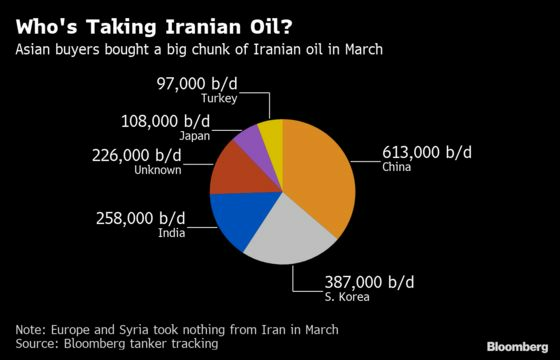 (Bloomberg) -- The biggest buyers of Iranian oil are said to be putting their purchases on hold as they wait to see whether the White House will extend waivers allowing them to keep buying the crude. Most Asian buyers are avoiding imports for next month as it’s unclear what will happen to the exemptions that are set to expire in the first week of May, according to people with knowledge of the matter. Even if the waivers are extended, it would be too late to order and receive cargoes for the month, said the people who asked not to be identified as the information is private. The U.S.’s surprise decision last year to allow eight nations to keep buying Iranian oil was a big contributor to the plunge in crude prices in the fourth quarter. While the White House appears keen to keep the pressure on the Persian Gulf nation, analysts including FGE have speculated that preventing further gains in oil prices is a bigger priority for President Donald Trump. Given that crude has recovered strongly this year, that suggests that at least some of the waivers may be extended. At least five refiners in South Korea, Japan and China are not planning to import Iranian crude and condensate loading in May, the people said. Some Korean and Japanese processors have already bought alternative cargoes for the period, while Iran is being flexible with its customers on timing, they said. Iranian shipments take over 20 days to reach east Asia, meaning there won’t be enough time for the cargoes to load and arrive during the same month. Japanese refiners say imports from Iran might start loading in June at the earliest if the exemptions are extended, the people said. The nation took 108,000 barrels a day of Iranian supplies last month, tanker tracking data from Bloomberg show. India may take some shipments next month if the waivers are extended because shipping time from Iran is only about a week, the people said. The South Asian nation was already in discussions for an extension of the waiver and the country’s processors are allowed to import 9 million barrels of Iranian oil every month under the 180-day exemption.